Question: Can a small hovercraft travel farther than a larger hovercraft? Hypothesis: A small hovercraft will travel farther than a larger hovercraft because the heavier weight uses up more of the hovercraft's forward energy. The lighter hovercraft reduces energy loss and will travel farther. Material 1: Be careful when using the hot glue gun: Do not touch the hot glue. It is very, very hot and can burn you! Cover the hole in the center of the CD with a piece of scotch tape. Poke 7 small holes in the scotch tape. Hot glue the pop top cap over the hole in the center of the CD. Be certain the pop top cap is closed. Blow up the balloon and place open end over the pop top cap being careful not to release air. Place the hovercraft on a smooth surface. Open the pop top cap allowing the air to pass through the holes in the scotch tape. Observe CD to determine if it is able to hover above the smooth surface. There are a number of different factors that affect the amount of time that the hovercraft will stay aloft as well as its ability to travel over the smooth surface. First, gravity plays a big part. If this experiment was conducted in a vacuum, the absence of air would ensure that both items fell to the ground at the exact same time because there would be no air resistance. Since the experiment is not conducted in a vacuum, the mass of the object is affected by gravity. Therefore, the larger, heavier object is pulled to the ground more due to its heavier weight and size. Because air resistance plays a large part in this, the results can be changed to make the larger, heavier hovercraft stay aloft an equal amount of time as the smaller hovercraft. 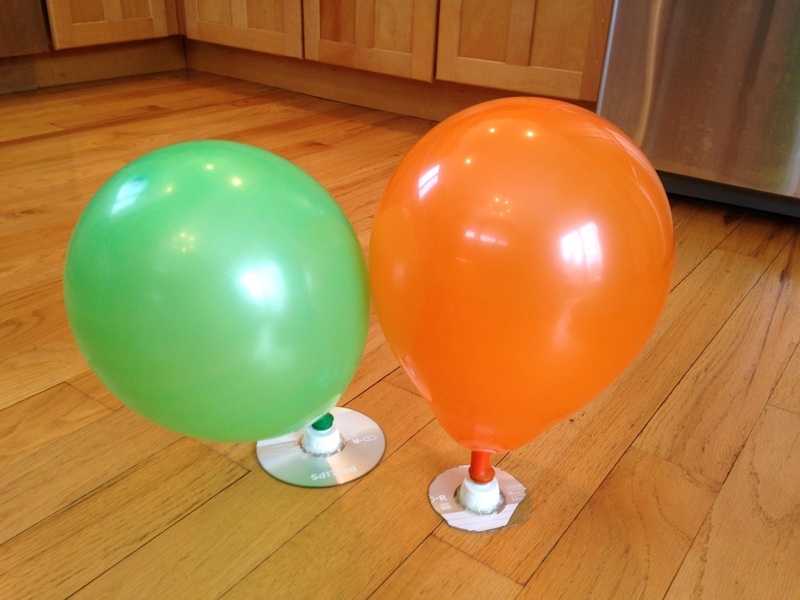 If the smaller hovercraft was fitted with a smaller balloon and less air and the larger hovercraft was fitted with a larger balloon with more air at an equal ratio to the smaller hovercraft, the two would stay aloft an equal amount of time. This would be because the air resistance of the two in relation to the gravitational force would be equalized. Conclusions: If both hovercrafts are fitted with balloons with an equal amount of air and the same amount of holes are punched through the scotch tape then with a small push, the smaller hovercraft will travel farther than the larger one because it has less mass and air resistance. Braeden is funny, friendly, nice, smart and artistic. He reads in his spare time. He has 3 cats and a dog. Ryan has a great sense of humor and is a good friend. He loves to play soccer, basketball, and collect cards. He has 2 cats, a cray fish, and a fish. Braeden and Ryan are 5th graders in Somers Intermediate School. They are in Mr. Camarra's class. Each of them has one sister.